The village of Valencia de Alcántara, in the Caceres region, has the title of “very noble, ancient and loyal town”. Since its foundation, its proximity to Portugal has made the town very important historically; as a matter of fact, it belonged to the Kingdom of Portugal between 1644 and 1668. But its true origin goes back much further than that. The current municipality of Valencia de Alcántara has been continuously occupied throughout the ages, and its successive inhabitants have left their marks on this prehistoric enclave. One particularly valuable example are the Neolithic dolmens which have been found in the vicinity. 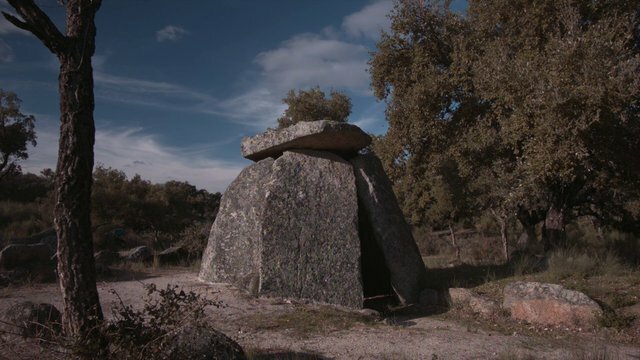 This burial structure is made up of 41 dolmens. It is one of the most important megalithic sites in the whole of Europe, having been declared a Cultural Interest Site, under the Archaeological Zone category, in 1992. Indeed, these dolmens have a very important cultural and territorial significance, particularly in view of the outstanding collection of funerary offerings, which tell us a lot about the way of life of these people who began to create what we now call society. If your interest is piqued, ask the Local Tourist Office for directions on the best way to reach this stunning prehistoric monument. There are five routes –Tapias, Zafra, Las Lanchas, Huertas de las Monjas and Los Mellizos (Twins) – which you can use to visit the different megaliths.